In stock -This product will ship today if ordered within the next 1 hours and 14 minutes. Comvita Oralfresh Natural Toothgel combines two proven natural oral-hygiene products, Propolis and Tea Tree Oil, in a sodium lauryl sulphate-free formula. 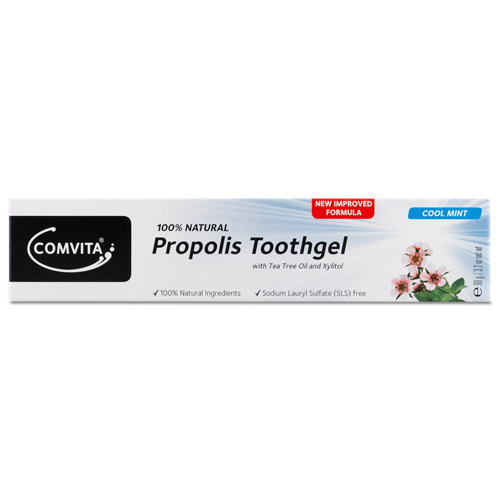 Comvita Oralfresh Toothgel is a pleasant, minty tasting, natural toothgel ultilising the properties of Propolis for supporting tooth and gum health. It is suitable for the whole family to use and is free of added fluoride, sugars, preservatives and artificial flavours. Glycerin, hydrayed silica, aqua, xylitol, caprylyl/capryl glucoside, Chrondrus crispus (carrageenan) powder, Melaleuca alternifolia (tea tree) leaf oil, propolis extract, Mentha arvensis (peppermint) leaf oil, Mentha viridis (spearmint) leaf oil, menthol, CI 75810 (Chlorophyllin-Copper Complex), xanthan gum, maltodextrin. Propolis may cause severe allergic reactions in allergy sufferers. If swelling of the mouth or throat occurs, discontinue use. Below are reviews of Comvita Propolis Toothgel - Tea Tree Oil-Cool Mint -90g by bodykind customers. If you have tried this product we'd love to hear what you think so please leave a review. The fact that the toothpaste is Black is a bit off-putting. The aftertaste is also not that great. However, I'm hopeful this toothpaste is doing its job without the fluoride & nasties of regular toothpaste! 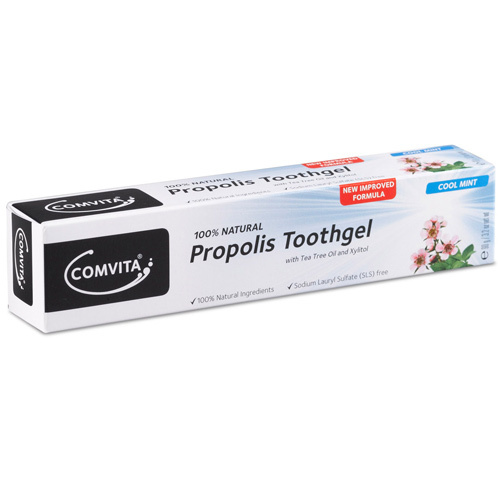 Comvita 100% Natural Toothgel combines two proven natural oral-hygiene products, Propolis and Tea Tree Oil. It is a pleasant, minty tasting, natural toothgel ultilising the properties of Propolis for supporting tooth and gum health.